So last Summer, I ended up wandering in John Lewis in a last ditch effort to see if they had any of the millinery bits I needed after I did not manage to make it to any of the habidashery shops in time for them to be open. After having no luck in the habidashery department of John Lewis either, I wandered the rest of the store a bit to kill off some of my annoyance. 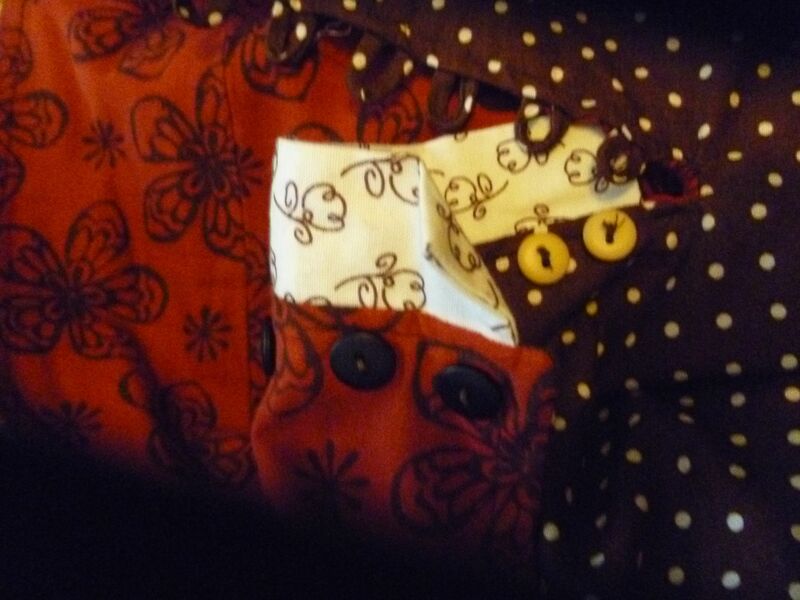 I also saw a really cute coat as I was riding the escalator upwards to the habidashery floor. The coat was less cute when on me (and in something of the £600 price range…ouch) so I wandered away from it and noticed they still had a bit of the summer sales lingering in the ladies fashion department. 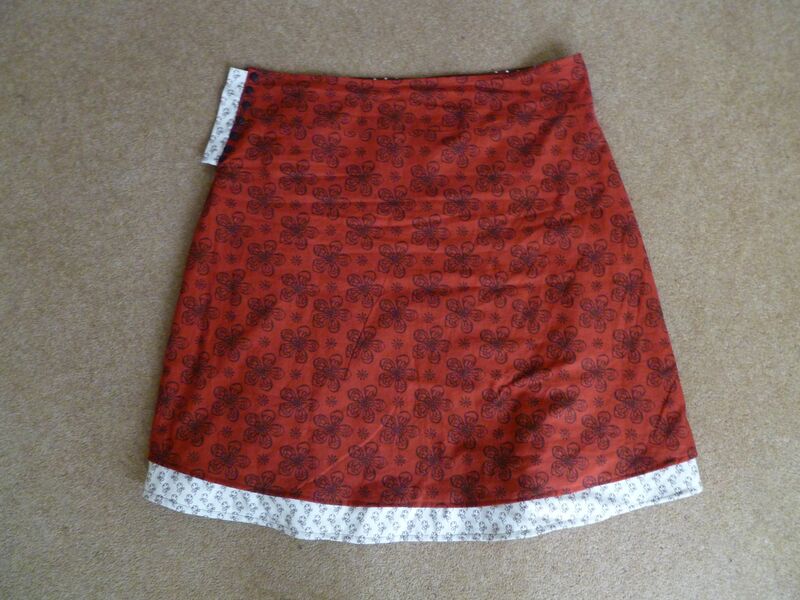 Nothing much exciting until I came across the White Stuff area when I noticed this cute skirt and how it said “reversible” on it’s tag. I took at closer look and was quite intrigued by the clever construction that allowed this which was mostly due to the button closure instead of a zip that allowed it to button on either side. 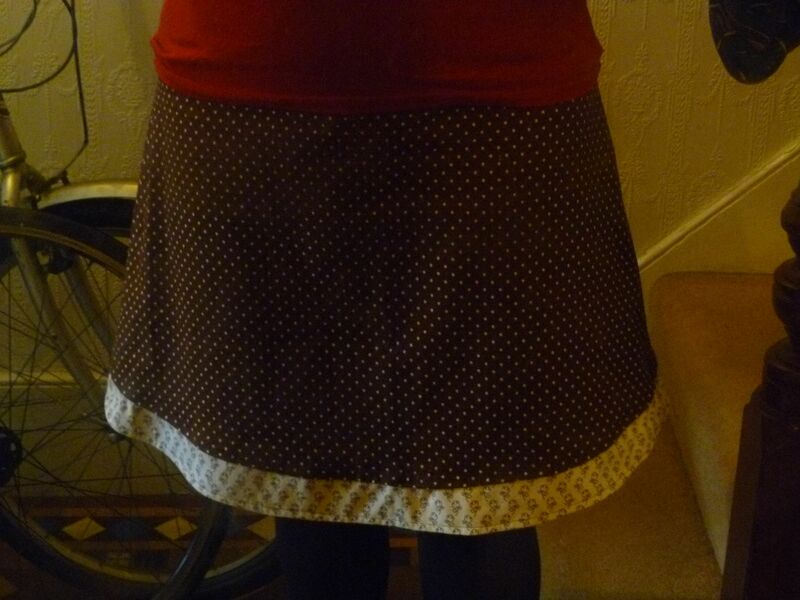 It was on sale, I liked the functionality of it for travel (2 in 1 skirt = less to pack) and I kinda wanted to take it home so I could deconstruct it a bit more to use it as a basis for making my own, so I bought it despite not being 100% in love with the fabric pattern (though it has grown on me since to being like 95% love). 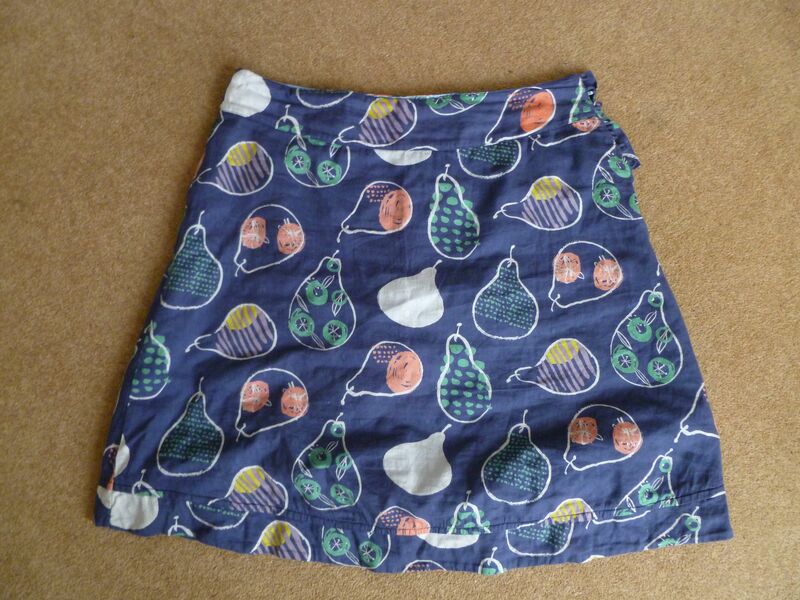 My end goal is I want to make one of these skirts with Dr Who fabric on one side and Firefly fabric on the other. (Yes I am that level of dork. Shut up.) However, I knew the first go or two (after watching my housemate do this in her never ending sewing quest for the perfect wrap jersey dress) did not have a high chance of being spectacular. So on my trip home to the US for Christmas I scouted out some cheap(ish) printed cotton that was still cute and would be wearable should it work out, to use for making a stab at a first go. I opted for this one to do different color buttons on the two sides mostly cause I didn’t have enough in one color to do both the same, but I like it how it turned out. 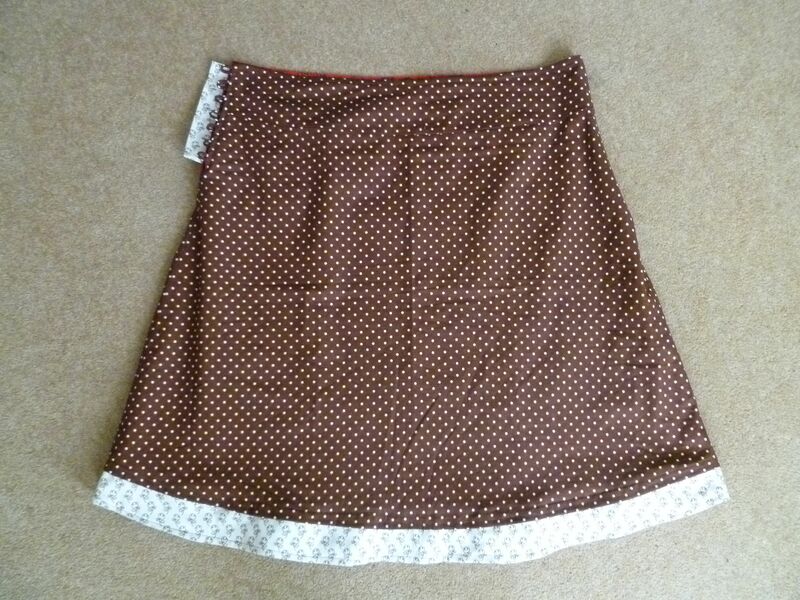 Current pattern is a bit tight in the hip (and loose in the waist but if there is more space in the hip then the skirt should ride lower) so needs adjusting to add maybe a half inch to an inch. 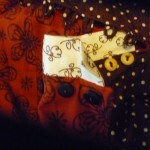 Doing the button tab in a really contrasty color not so great as thought. 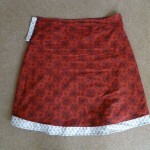 Try using the two skirt fabrics one on each side. Make the opening slightly longer. 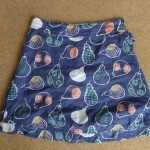 It might be better to attach the panel and do the hems of the two skirts before seaming them at the top into the reversible state. 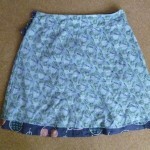 To add the peek-a-boo panel at the bottom, I would double fold over the skirt hem. 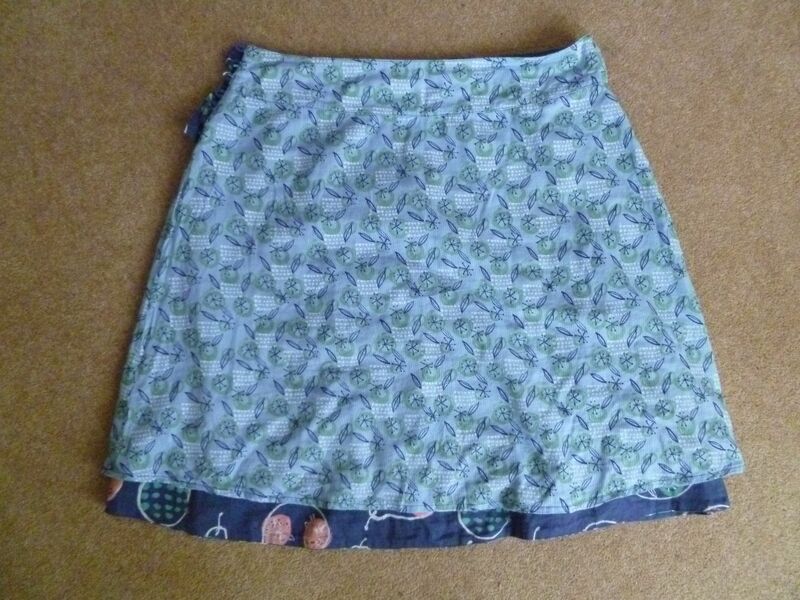 Tuck the rough end of the panel into the fold so it’s facing upwards into the skirt (instead of down). Do the hem like this. 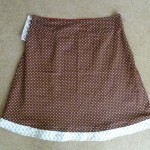 Then fold over the panel to it’s proper place (and iron) then do another hemline to keep this in place. I think doing it this way should help reduce any potential fraying but does require making the panel taller. 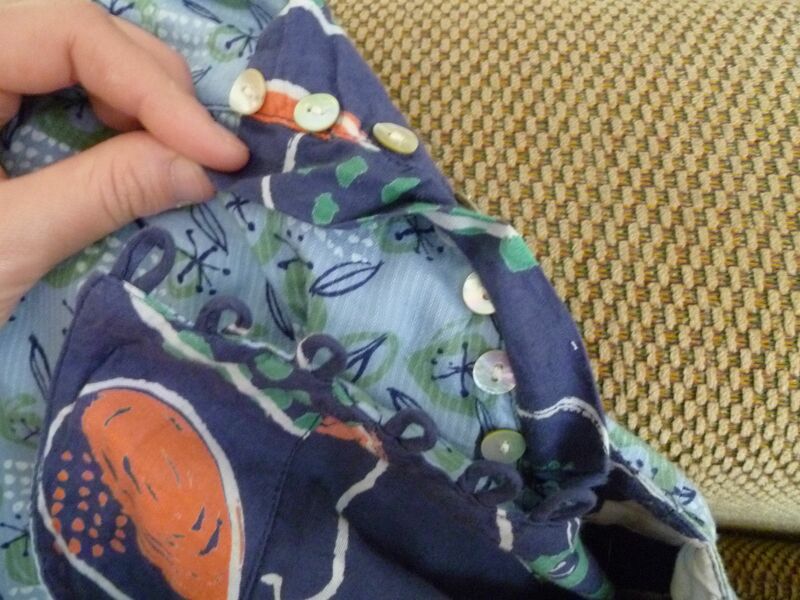 Get better at doing the button loops and actually make them the same size. 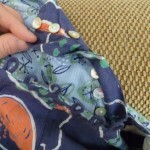 Sew the buttons on looser. So not quite ready to jump to my sci-fi geekette of awesome skirt just yet, but not a bad first go.